Technologies designed for editing the human genome are transforming biomedical science and providing us with relatively simple ways to modify and edit genes. However, precision editing has not been possible for cells that have stopped dividing, including mature neurons. This has meant that gene editing has been of limited use in neurological research — until now. Researchers at the Max Planck Florida Institute for Neuroscience (MPFI) have created a new tool that allows, for the first time ever, precise genome editing in mature neurons. This relieves previous constraints and presents amazing new opportunities for neuroscience research. This novel tool is based on CRISPR-Cas9 gene editing technology. Originally, the CRISPR tool was discovered in bacteria, a defense mechanism against viral attacks. It works to “edit” the genomes in cells because, once inside them, it interrupts the DNA in a target location, causing damage, and then repairs it in one of two ways. Scientists favor damage repair via homology directed repair (HDR), which is less likely to result in errors, far more precise, and can allow for the insertion of specific genes. In other words, researchers use the HDR method because it enables them to add, delete, or modify genes to match their intended goal. CRISPR’s use in neurons faced a critical obstacle — the HDR repair mechanism was historically believed to be possible only for cells that still dividing in the body. Neurons are mature brain cells, past the proliferation stage, and were unable to use the HDR repair mechanism. This was all true, but the development of this new strategy has created previously impossible opportunities with the use of mature neurons. 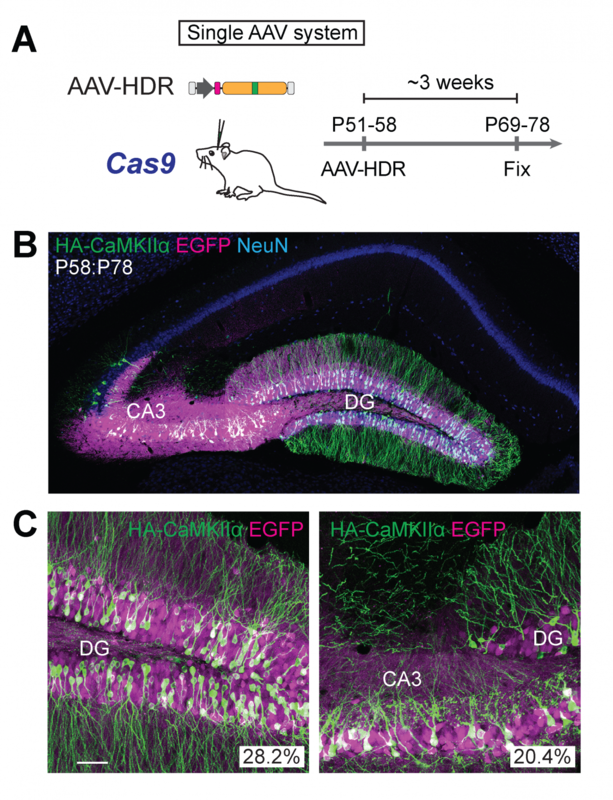 The technique is called “vSLENDR (viral mediated single-cell labeling of endogenous proteins by CRISPR-Cas9-mediated homology-directed repair).” It allows neurons which are no longer mitotic to use the HDR repair mechanism, and it works by combining the adeno-associated virus (AAV) and CRISPR-Cas9. The AAV has been used by researchers to deliver various kind of genes and is nontoxic. It serves as a donor template, rendering the HDR technique more efficient. The researchers first delivered the necessary genome editing equipment to the neurons of transgenic Cas9 expressing mice using the AAV. Next, the team created a similar dual-viral system that would work in animals that had not been modified to express Cas9. They tested this vSLENDER technique in an aged Alzheimer’s disease mouse model and proved that it could be applied, even at advanced ages, in pathological models. In short, the team was able to demonstrate that vSLENDR makes the precise editing of genetic information possible in any kind of cell, in any part of the body. This could allow us to further understand neuropathological diseases, enhance our capacity to research and develop novel treatments, and even innovate and improve preventative therapeutics and cures.